THE INDIA CEMENTS LIMITED is the largest producer of Cement in South India with a market share of 14% and a total production capacity of 3.6 Million Tonnes of cement per annum. The company operates four cement plants, three in Tamilnadu and one in Andhra Pradesh. ICL's turnover and net profit in 1996-97 was Rs. 8,320 million and Rs. 825.4 million respectively. 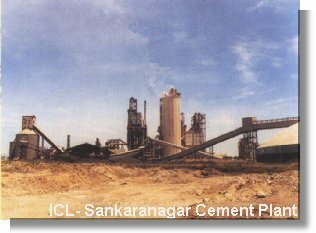 ICL has recently acquired Visaka Cement Industries Ltd. which is putting up a 0.9 Million Tonne Cement plant in Tandur, Ranga Reddy District, Andhra Pradesh. The plant, which is expected to go onstream in 1998 will raise the company's capacity to 4.5 Million tonnes per annum. This project envisages an investment of Rs. 3,200 Million. 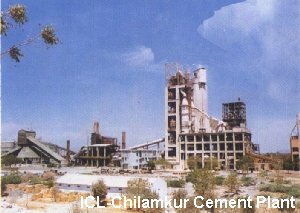 ICL has also obtained the Government of India's approval for the outright purchase of a 0.4 Million Tonne cement plant of Cement Corporation India at Yerraguntla, Andhra Pradesh. With this acquisition at a cost of Rs. 2,000 Million, the company will have three Cement plants in Andhra Pradesh, raising it's overall to 5 Million Tonnes per annum. The Company also has a presence in Shipping, Real Estate, Chemicals and Finance.